Estimates for this country take into account the effects of excess mortality due to AIDS; this can result in a lower total population than might otherwise be expected. ↑ १.० १.१ "Côte d'Ivoire". The World Factbook. CIA Directorate of Intelligence. 24 July 2008. Retrieved 8 August 2008. 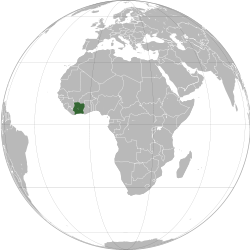 ↑ २.० २.१ २.२ २.३ "Côte d'Ivoire". International Monetary Fund. Retrieved 17 April 2013.